(l to r) SXM Airport Head of Delegation, Stephania Kong - Gumbs, Chairman of the IASC, Dharmindra Phalai and Newly appointed Public Relations Officer of IASC, Johnathan Hoepel. SIMPSON BAY, St. Maarten ((Sunday, 27 May, 2018) – Stefania Kong-Gumbs, Head of the Princess Juliana International Airport, SXM, delegation at the just concluded 12th Annual Is-Lands’ Airport Safety Committee, (IASC) conference was presented with the Committee’s first Award of Excellence at the closing of the meeting on Friday May 25, 2018 at the Simpson Bay Resort. The Committee discussed issues related to all aspects of operational safety at aerodromes from Monday, May 21st through Friday, May 25th, 2018. The Princess Juliana International Airport- SXM- hosted the conference which attracted delegations from Antigua & Barbuda, Anguilla, Aruba, Bonaire, Curacao, Saba and Suriname. Participants also included the Section Head of the St. Maarten Civil Aviation Authority, Shaka Lake. The committee members of the SXM Airport were pleasantly surprised that the first IASC Award of Excellence went to its Head of Delegation, Stefania Kong- Gumbs who serves as a Quality Assurance Officer at SXM Airport with Manager, Connally Connor and fellow officer, Deshawn York. 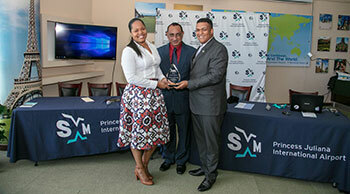 The trio were elated with the accolade and praised the SXM Managing Board for granting them the opportunity to host the conference, in spite of the constraints. The conference program was designed to offer participants an opportunity to engage in interactive sessions, and observe how the SXM Airport continues to recover from the devastation and aftermath of hurricanes Irma and Maria. The delegations engaged in the safety audit for a period of two days, as they presented its findings. The safety audit is essential as it would reveal the deficiencies that exist at the airport, by an independent non-punitive committee. The audit would serve to help SXM Airport to better improve the standards and recommended practices mandated by International Civil Aviation Organization (ICAO). According to the Chairman of the IASC, Dharmindra Phalai, SXM Airport will receive the written version of the audit report no later than 6 weeks after the end of the conference. The Quality Assurance Department will prioritize the high-risk findings and implement the necessary mitigation measures. During the closing ceremony, the Chairman Dharmindra Phalai announced that the Heads of Delegations committee had agreed to appoint Jonathan Hoepel as the first IASC, Public Relations Officer for a period of four years. Hoepel took the liberty to announce that he presented two safety proposals to the IASC board, which were met with approvals and should be implemented accordingly. Meanwhile, it was also determined that the presence of the Federal Aviation Administration (FAA) would be welcomed at the annual IASC meetings. The conference concluded with the closing remarks by the Director of Finance, Michael Lake on behalf of the Acting Chief Executive Officer, CEO and Chief Financial Officer, CFO, Ravi Daryanani. Lake emphasized the commitment to safety by the Management of the SXM Airport. The 2019 IASC conference will be hosted in Suriname.